A specific copper complex is used here for the development of new antibacterial coatings against two different bacteria strains i.e. Escherichia coli (E. coli) and Staphylococcus aureus (S. aureus). Remarkably, the cationic polymerization of a glycerol-derived monomer was performed using an efficient Cu complex as a photoinitiator. 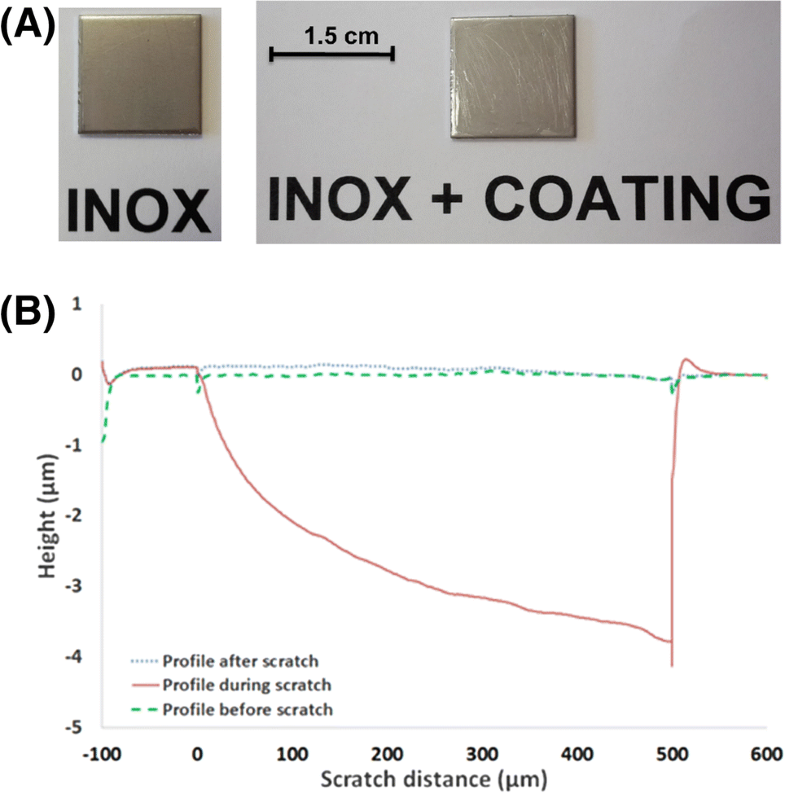 The synthesized coatings which were successfully developed under UV–visible light exposure and under a solvent-free cationic photopolymerization process show excellent adhesion on stainless steel plate according to nanoindentation and scratch tests. 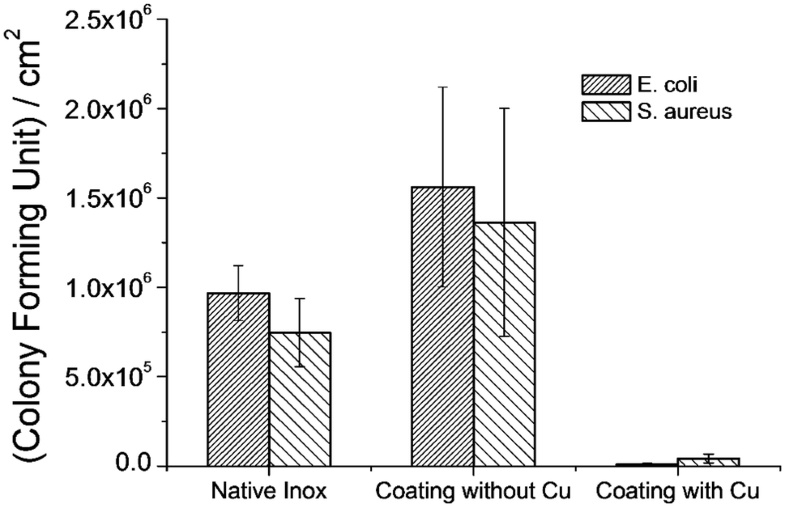 The resulting glycerol-derived coatings have been conducted to assess the antibacterial activities against E. coli and S. aureus: a tremendous decrease of 99.9% and 96% of the adhered Escherichia coli and Staphylococcus aureus on the surface of copper containing coatings has been demonstrated in comparison with bare stainless steel supports. Finally, our investigation suggests from live/dead assays data that the synthesized polymer films show biocidal properties due to the release of Cu2+ ions, which are responsible for inhibiting bacterial proliferation. Hospital-acquired bacterial infections [1, 2, 3], also called nosocomial infections, have become an expanding public health issue since decades and are responsible to several hundreds of thousands deaths every year around the world along with a tremendous increase of the healthcare costs. Despite the development of new antimicrobial drugs for treating infections, multi-drug resistant bacteria have emerged, thereby leading to inefficient treatments. In order to prevent such bacterial infections, antimicrobial polymer coatings have been intensively explored. Polymer coatings (biocidal or otherwise) have been particularly investigated as a means to prevent bacterial adhesion and proliferation, according to either an “active” or a “passive” process. Passive coatings rely on the antifouling properties to inhibit bacterial adhesion [4, 5, 6] (e.g. PEG-containing or perfluorinated coatings) whereas “active” coatings lead to the biochemical death of bacteria simply by contact [7, 8, 9, 10, 11, 12, 13] (like polymers bearing quaternary ammonium functions, guanidine-containing polymers, natural peptides derivative polymers, phospho and sulfo derived polymers, phenol and benzoic acid derivative polymers, organometallic polymers, and polyelectrolyte multilayers), by the use of reactive oxygen species [14, 15, 16, 17, 18] or by the release of inorganic antimicrobial compounds [19, 20, 21, 22, 23] (e.g. zinc oxide, TiO2, montmorillonite-derivative clays, and silver nanoparticles). 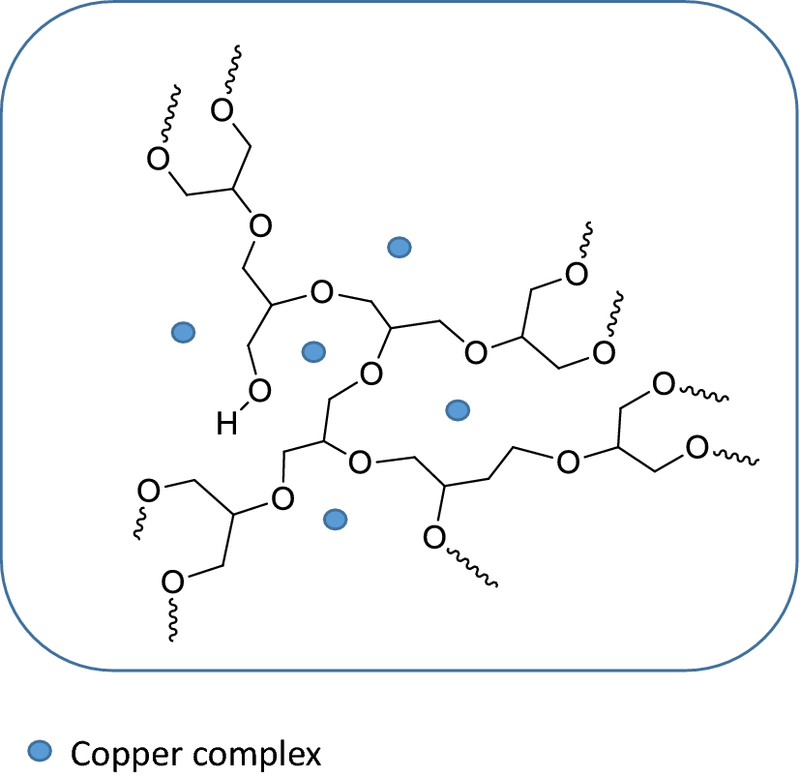 Amongst the multitude of metal complexes proposed, copper complexes CuCs are receiving an increasing consideration, especially due to their low cost synthesis and their high potential in polymer chemistry [24, 25]. The design of copper complexes with relatively high lifetime excited states allows its use into various fields such as organic light emitting diodes (OLEDs), photoredox catalysts or photoinitiators for polymer synthesis [26, 27, 28, 29, 30, 31, 32, 33] but few investigations rely on the use of such copper complexes in biomedical field. In light of this observation, our study demonstrates that a chosen type of copper complexes could be used as antimicrobial agents. As is well known, copper ions have been used for centuries to purify and disinfect liquids, solids and tissues [34, 35] either alone or in complexes. Behind to its consideration as being safe to humans [36, 37], and in contrast to its low sensitivity to the body tissues (skin, etc..) , copper is a powerful agent toward micro-organisms . Following this research line, an interesting copper complex is used for the synthesis of new solvent-free materials with interesting antimicrobial properties. The rise of interest toward renewable resources derivative monomers [40, 41] prompt us to use glycerol as building blocks. Indeed, glycerol is one of nature’s wonders which appears as a component present in all living cells. It is naturally found in wines, beers, bread, and other fermentation products of grains and sugars. Industrially, glycerol is a product of fats and oils and its global market size is likely to exceed USD 3 billion by 2022 with a growing rate at over 8%. The originality of this investigation is based on the versatility of a copper complex with dual activities: first as a photoinitiator when added to iodonium salt (Iod) for the cationic polymerization of a glycerol epoxidized monomer, and second as a biocidal agent against Escherichia coli (E. coli) and Staphylococcus aureus (S. aureus). To the best of our knowledge, this study is the first example of copper complex use with such dual performing properties. The photoinitiation ability of the (copper complex/Iod) system and the resulting generation of photoacids able to perform the synthesis of the glycerol-derived coatings under light exposure, are investigated by Real Time Fourier Transform Infrared spectroscopy (RT-FTIR) and UV–visible spectrometry. In addition, the resulting polymer surfaces were characterized by X-ray photoelectron spectroscopy (XPS) and the release of copper ions was evidenced by inductively coupled plasma (ICP). The resulting glycerol-derived coating adhesion on stainless steel plate was demonstrated by nanoindentation and scratch tests, and their antibacterial properties were tested against two bacteria strains, i.e. E. coli and S. aureus. Glycerol diglycidyl ether (GDE) and Rhodhamine B (RhB) were purchased from Aldrich. Iodonium 4-(2-methylpropyl)phenyl-hexafluorophosphate (Iod, it absorb in the 200–300 nm range with a maximum at 250 nm) was kindly provided by Badische Anilin und Soda Fabrik (BASF). The synthesis of the non commercial copper complex (CuC) has been described in ref 33. CuC has a high molar extinction coefficient e.g. ɛ = 3600 M−1 cm−1 at λmax = 355 nm. It absorbs remarkably in the 300–450 nm spectral range. All chemicals were used as received with the best purity available. Table 1 shows the chemical structure of the molecules used in our investigation. A0 represents the area at t = 0 s and At represents the area at time t.
The UV–Vis absorption spectra were carried out using a Cary 60 UV–Vis spectrometer from 200 to 800 nm. XPS measurements were performed using a K-alpha Thermo Scientific photoelectron spectrometer with monochromatized Al Kα excitation (hν = 1486.6 eV). The compositions of the surface film were determined by measuring integrated photo-peaks intensities after a Shirley background subtraction. The peaks areas were corrected from sensitivity factors. The X-ray spot diameter was 400 microns. Survey spectra were acquired with an energy step of 1.0 eV over a binding energy range of 0–1200 eV, using a pass energy of 200 eV. The high resolution spectra for the C1 s, O1 s and Cu2p were obtained with a pass energy of 50 eV with a 0.05 eV energy step. The dwell time was 100 ms for all acquired spectra. The analysis chamber base pressure was by 8.0 × 10−10 torr. For the charge compensation, electron flood gun combined with an argon ion gun were used. Square stainless steel substrate plates (1.5 × 1.5 cm) were washed with toluene and ethanol before being dried under vacuum at 40 °C for 4 h. Glycerol-derivative solution with CuC was deposited on stainless steel substrate and layed down by means of a 100 μm calibrated wire-wound applicator. Samples have been first irradiated under a Lightningcure LC8-03 lamp for 600 s (light intensity = 70 mW/cm2). Both sides of the stainless steel substrate were irradiated under the same conditions. For Glycerol-derivative solution without CuC, cationic photopolymerization was performed with the Iod photoinitiating system and the resulting coatings on stainless steel substrates have been likewise done. The measurement of pencil hardness begins with the lowest pencil and continues up the scale to determine the maximum hardness able to scratch the surface of the glycerol-derived coatings (Method: ASTMD3363-74, 2000). This method which has been recommended by National Coil Coating Association, provides inexpensive means of evaluating the film hardness and adhesion of the polymer coating on stainless steel substrate. The hardness of the coating was determined relative to a standard set of pencil leads. The surface hardness is determined by scratching the leads across the coating at a controlled angle of 45º and the values is given to the pencil able to induce a scratch on the surface of the coating. The pencil hardness was measured using a No. 553 pencil hardness tester (Yasuda Seiki Seisakusho LTD.). Pencils were supplied by Staedtler Mars Lumograph 100 (Germany). Nanoindentation and scratch tests were carried out on the coatings deposited on steel substrates with a Nano Indenter (Agilent Technologies G200) using a Berkovich tip (Micro Star Technologies). Twenty-five Nanoindentation tests per sample were performed. Experiments parameters are the same as those in reference. The amount of copper ions release from the glycerol-derived films containing Cu ions was determined by inductively coupled plasma spectrophotometer (ICP, Thermo Jarrell Ash IRIS-AP). For this, the samples (square samples with a 1.5 × 1.5 cm length) were immersed in 10 mL of phosphate buffer saline (pH 7.0) for different time periods (4 days). Initial adhesion assays on glycerol-derived coatings with and without CuC and stainless steel substrates were performed using E. coli ATCC25922 and S. aureus ATCC6538. The bacteria were incubated aerobically in Luria–Bertani broth overnight at 37 °C, under stirring. The resulting cultures were diluted to an optical density (OD 600 nm) of 0.05 in sterile LB broth. Then, the glycerol-derived coatings deposited on stainless steel substrates (1.5 × 1.5 cm) were immersed in the bacterial formulation. The vials containing the substrates were placed on a slantwise rotating wheel in order to avoid the sedimentation of bacteria. The solutions with the coatings were incubated for 3 h, and shaken at 150 rpm to allow for initial adhesion (INFORS AG-CH 4103, Bottmingen-Basel, Switzerland). After the incubation time, the coatings were rinsed seven times with sterile saline solution (NaCl, 0.9% w/v), to remove any bacterial cell not adhering to the coating. Each sample was then transferred to 2 mL of sterile saline solution and vortexed for 30 s. The samples were then plunged in a second 2 mL sterile saline solution and sonicated in a Branson 2200 sonicator for 3 min. Samples were once more transferred to another 2 mL of sterile saline solution and vortexed for 30 s. Suspensions obtained by the treatment of vortex and sonication were assembled, serially diluted and plated on plate count agar (PCA) medium for viable CFU counting. The bacteria removed during the three steps made up the loosely attached biofilm population. A hundred µL of this solution was spread on a PCA plate. The process was repeated successively for 24 pre-dried substrates. The plates were incubated overnight at 37 °C. Counting colony forming units (CFUs) allowed determining in fine the total bacterial adhesion. Levels of adhesion were reported as numbers of cells per square centimeter. All values corresponding to the anti-adherence property of the coatings towards E. coli and S. aureus are reported as mean ± standard deviation. Student’s t test was used to make statistics analyses on the antibacterial tests and for the calculation of significance level of our antibacterial data. Differences were considered statistically significant for p < 0.05. Ten samples were evaluated for each group. A well-known live/dead assay method allows the evaluation of the cell viability after E. coli and S. aureus were culturing on the native stainless steel substrates and the glycerol-derived coatings for 3 h based on the previously reported method . Briefly, the bacteria adhered were harvested using an aqueous solution (1000 mL) containing Tween 80 surfactant (2 g) and sodium chloride (5 g). 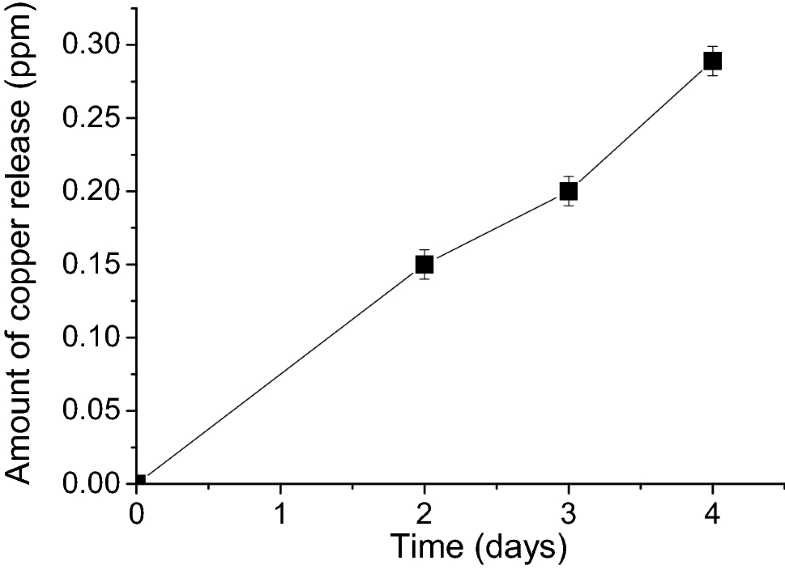 Subsequently, 15 µL of a cell suspension was mixed with a 9 µL assay solution [3 µL SYTO 9 solution (1.67 mM in dimethyl sulfoxide (DMSO)) and 6 µL propidium iodide solution (1.67 mM in DMSO)] and incubated for 15 min at 25 °C. The stained cell solution was moved to slide cover glass and then fluorescence images of the cells were visualized with a confocal laser scanning microscope (CLSM 700, Carl Zeiss, Germany). 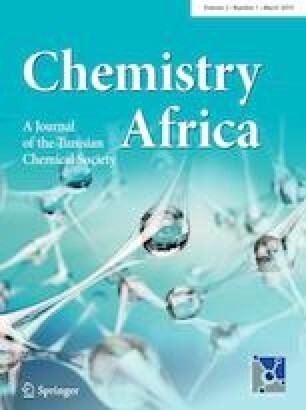 The success of the cationic photopolymerization of the glycerol epoxidized monomer was demonstrated by RT-FTIR (Fig. 1b) and by the generation of photoacids upon the light exposure of the CuC/Iod photoinitiating system (Fig. 1a). In this experiment, the copper complex and Iod are mixed together in acetonitrile in presence of an acid indicator, e.g. rhodamine B (RhB). As shown in Fig. 1a, the growth of the acid form of RhB at 550 nm confirms the photoacids formation upon light exposure. It is woth noticing that the irradiation of Iod alone in the same conditions does not lead to any photoacid and thus the photopolymerization of the glycerol epoxidized monomer is not observed. Reciprocally, the irradiation of CuC alone does not form any acid protons. 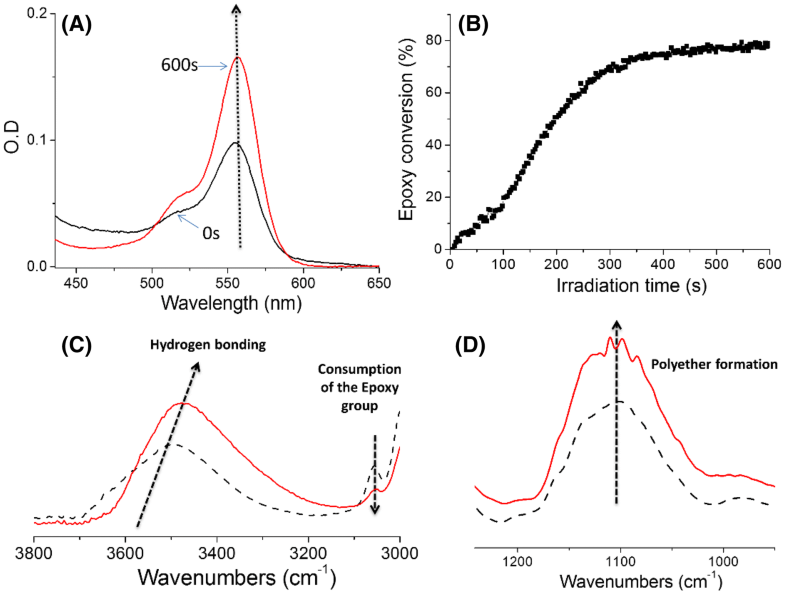 For the first time, the kinetic profiles of the glycerol epoxidized monomer/CuC/Iod formulation under light irradiation was followed accordingly by RT-FTIR and by the decrease at 3050 cm−1 of the epoxy group (Fig. 1b, c). During the irradiation, a new peak which corresponds to the formation of a polyether network at 1080 cm−1 (Fig. 1d) appears along with the decrease of the epoxy group, thereby demonstrating the photopolymerization of the glycerol epoxidized monomer. After 600 s of irradiation the final epoxy conversion reaches 80% and the resulting coating is totally tack-free. The photoacids generation as well as the cationic photopolymerization of the epoxidized glycerol monomer are in accordance with our previous investigation  (r1–r6). Under light irradiation, the metal-based photocatalyst CuC go through its excited state *CuC (r1). In a second step, the iodonium salt (Iod) acts as an oxidant and an unstable radical Ph2I∙ is therefore generated and converted into Ph∙ and PhI (r2). PhI plays as a reductant and CuC(I) is regenerated along with the formation of PhI+∙ (r3). According to Pappas and coworkers [43, 44], a reaction between the intermediate PhI+∙ and iodobenzene (PhI) may occur to produce a new transient species [PhI–PhI]+∙ (r4). This intermediate may be oxidized by diphenyliodonium ion to yield [PhI+-PhI], together with the formation of a diphenyliodine radical (Ph2I∙) and photoacids (H+) in r5. The later were responsible for the ring opening of epoxides in r6, thus leading to the formation of a polyether network (Schema 1). XPS measurements will confirm this statement. In order to investigate the chemical nature of the functions available on the surface of the glycerol-derived coatings with CuC, XPS measurements have been performed. Figure 2 displays the survey spectrum and the high resolution C1 s, O1 s and Cu2p core level peaks. The high resolution C1 s spectrum (Fig. 2b) was fitted with three components: the first one (284.7 eV) is assigned to the carbon aliphatic chain (C–C or C–H) [45, 46], the second to the carbon covalently bond to one oxygen (C–O, BE = 286.2 eV) [47, 48] thus confirming the formation of a polyether network and the last one at BE = 288.1 eV could be attributed to N–C=N chemical binding [49, 50]. A weak N1 s peak signal (not shown here) at 401.3 eV (C=N) confirms the presence of the N–C=N bonds [49, 50]: it is likely due to the presence of the CuC complex at the surface of the coating. The resolved O1 s spectrum (Fig. 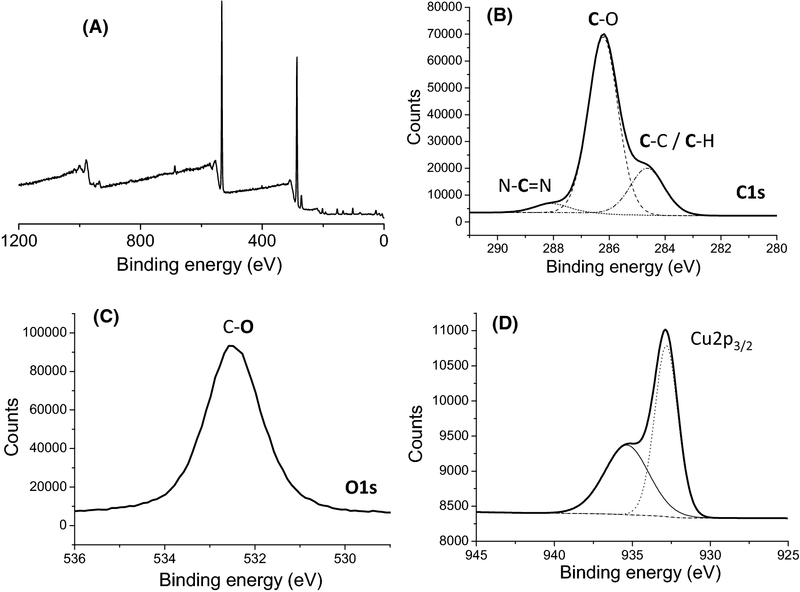 2c) regarding the glycerol-derivative coating with CuC revealed only one peak at 532.5 eV for C–O chemical bondings . Finally, Fig. 2d exhibits a Cu2p3/2 signal at the binding energies of 933 eV and 935.4 eV. The position of this peak clearly indicates the presence of Cu (II) species  and the higher binding energy peak at 935.4 eV is due to a shake-up satellite visible for Cu(II) only. This result is in accordance with the photoinduced formation of Cu(II) species according to the photooxidation process described in the first section (r1–r6). All these results thus confirm that ligand is trapped in the polymer coating. The hardness of the coatings has first been evaluated with a standard set of pencil leads. The pencil hardness of such coatings always appears above 7H; this means that no macroscopic scratches could be observed up to a hardness of 7H. Further nanoindentation experiments and scratch tests have been done to complete the mechanical studies of the coatings. The overlap of the loading and unloading curves during the nanoindentation tests performed on the glycerol-derived coatings with CuC demonstrates a quasi-elastic behavior. At room temperature, the polymer surface appears in a rubber-like state, with an elastic modulus which is evaluated at 1.780 ± 0.700 GPa. Moreover, the coating shows a perfect elastomeric behavior (Fig. 3b) according to the scratch resistance tests with neither delamination nor brittle fracture or residual imprint in the coating surfaces. This result indicates interesting properties such as a good adherence to the stainless steel substrate along with a good fracture resistance. The ability of the glycerol-derived films to inhibit the bacterial adhesion has been evaluated against Gram-negative E. coli and Gram-positive S. aureus. The synthesized coatings, i.e. glycerol-derived coatings with and without CuC, and the pristine stainless steel substrates have been incubated for 3 h in bacterial suspensions within a fixed concentration. 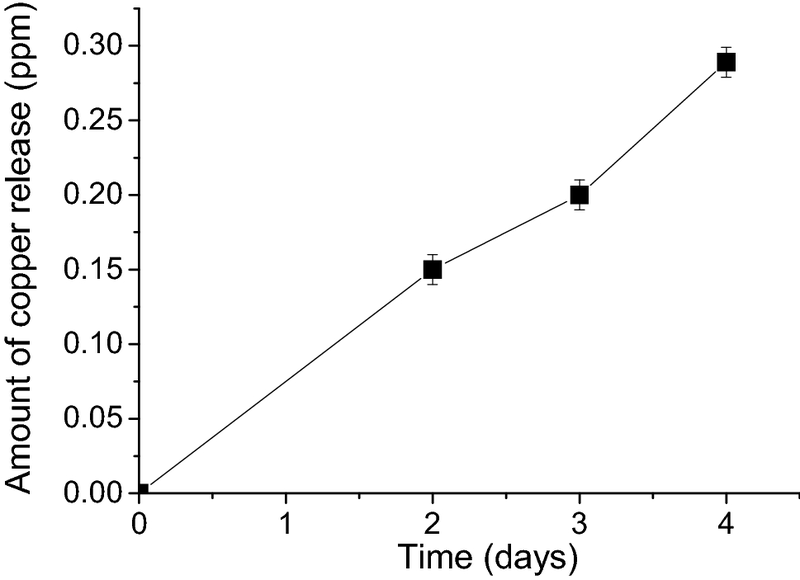 A well-known bacteria counting method [8, 19] was used to evaluate the number of colony forming units (CFUs) per cm2. Stainless steel substrates and glycerol-derived coatings without CuC did not significantly inhibit E (Fig. 4). coli and S. aureus adhesion. The number of CFU/cm2 reaches approximatively 1 × 106 and 1.5 × 106 for the stainless steel substrates and glycerol-derived coatings without CuC respectively independently of the bacterial strains used. On the other hand, the introduction of CuC into the glycerol-derived materials leads to a tremendous reduction of the bacterial adhesion. Indeed, the adhesion of E. coli and S. aureus decreases respectively of 99.9% and 96% compared with pristine stainless steel substrates. 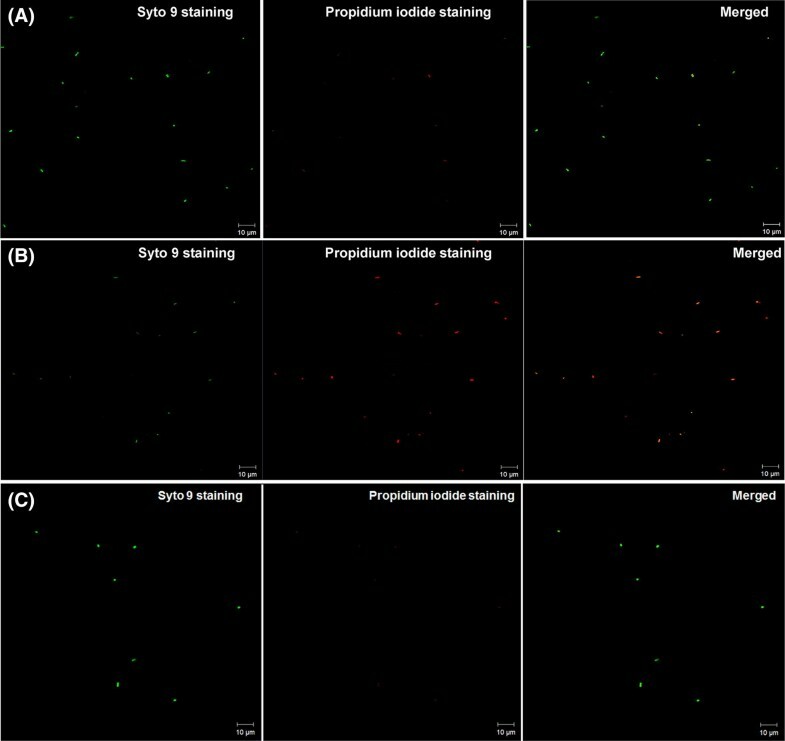 Further investigations concerning the viability of E. coli and S. aureus on the bare stainless steel substrates and glycerol-derived coatings (with and without CuC) have been performed. Live/dead assays with E. coli and S. aureus are displayed on Figs. 5 and 6, respectively. 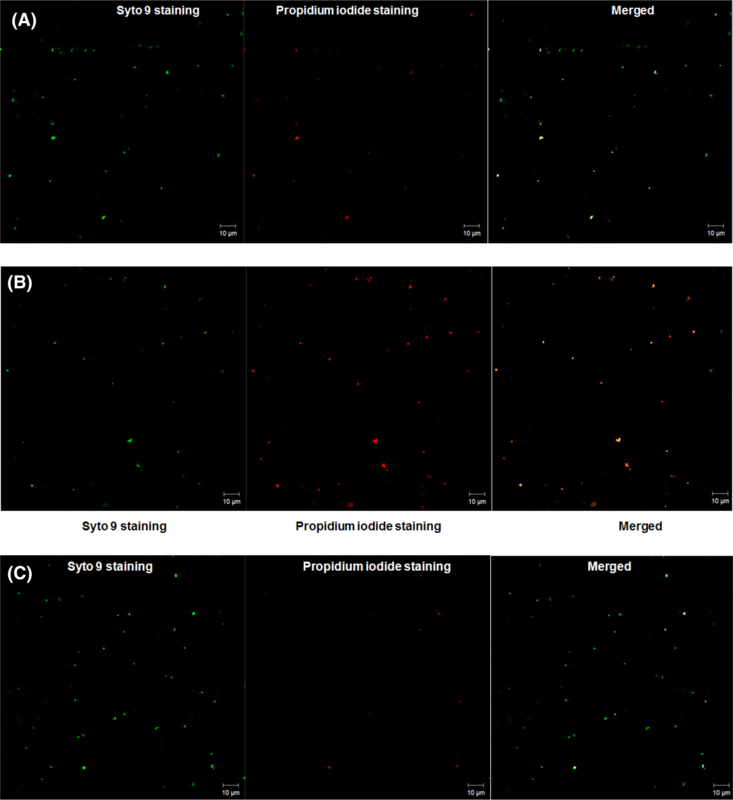 The fluorescence color of the bacteria cultured on glycerol-derived coatings without CuC and on pristine stainless steel substrates appears entirely green, thus demonstrating a good viability of the bacteria (Figs. 5a, c for E. coli and Fig. 6a, c for S. aureus). On the other hand, cultured bacteria [E. coli (Fig. 5b) and S. aureus (Fig. 6b)] on the glycerol-derived coatings with CuC show red fluorescence thus indicating their death. Interestingly, the results of the live/dead assays suggest that the polymer films containing CuC show biocide properties. These results could be explained by a slow release of the copper ions through the polymer matrix. As shown in Fig. 7, the amount of released copper ions (calculated by ICP) increases moderately with the time of incubation, and it reaches 0.3 ppm over the period of 4 days. According to the ICP results, the decrease of the number of E. coli and S. aureus CFUs after 3 h of incubation highlights that copper ions are responsible for the biocide properties of the glycerol-derived coatings with CuC. These cations may be either at the surface of the film, or released from the coating. These results are in agreement with literature data. Many studies suggest that dissolved copper ions released from the coatings lead to cell alteration by “contact killing” [52, 53, 54]. Accumulation of copper ions into intracellular membrane is responsible for cell death by damaging its membrane. For example, Hong et al. focused on the mechanism of membrane degradation in E. coli when exposed to different copper alloy surfaces: they highlighted that E. coli is triggered by non-enzymatic oxidative damage of membrane phospholipids, thus leading to the loss of the membrane integrity. Other investigated studies [54, 56, 57] have demonstrated that the penetration of copper ions into the cell membrane is followed by an oxidative stress and DNA degradation. This study dealt with the use of an efficient CuC/Iod photoinitiating system for the synthesis of anti-adherent and biocidal glycerol-derived coatings. The resulting coatings show a perfect elastomeric behavior and indicate a good adherence to the stainless steel substrate as well as a good resistance to fracture. Moreover, anti-adhesion property was shown to be efficient even at a relatively low concentration in CuC (0.9 wt%): an average decrease of respectively 99.9% and 96% of the adhered E. coli and S. aureus on the surface of CuC-containing coatings was demonstrated in comparison with bare stainless steel substrates, after only 3 h. Interestingly, the live/dead assays evidenced that the polymer films containing CuC show biocidal properties due to the release of Cu2+ ions. The success of the biocidal properties of the CuC coatings prompts us to go further in the antibacterial experiments. The synthesis of new Ag or Cu derivative complexes with visible absorption and photoinitiating properties are under progress and we expect to increase the biocidal activities of the resulting coatings for a longer incubation time. Such coatings could be used for hand-care utensils like pliers, for example. The authors would like to thank CNRS, UPEC and French National Agency (sPECTRAL project) for financial support.